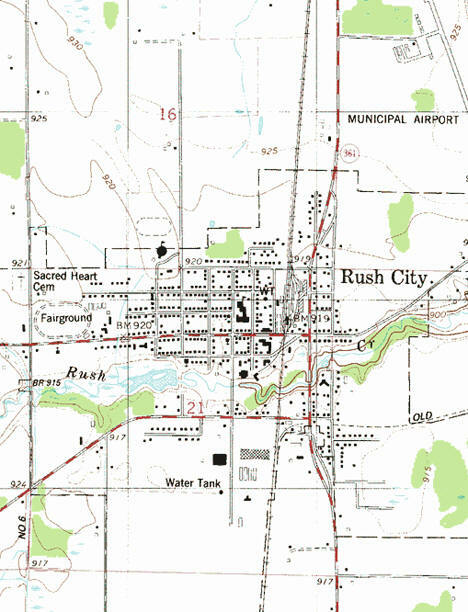 Do you have photos, historical accounts or other items pertaining to the Rush City area? Would you like to share this historical information with the world? LakesnWoods.com would like to publish your Rush City photos (current or historical) or historical accounts on this website. Original materials can be returned and your privacy will be respected. Rush City is a city in Chisago County, Minnesota. It is fifty-eight miles north of Minneapolis–Saint Paul. Interstate 35 serves as a main route for the community. According to the United States Census Bureau, the city has a total area of 4.32 square miles (11.19 km²), of which, 4.25 square miles (11.01 km²) of it is land and 0.07 square miles (0.18km²) is water. The elevation is 915 feet (279 m). 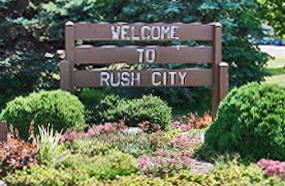 RUSH CITY, a city of Rushseba Township; incorporated on March 8, 1873, and reincorporated on February 16, 1909. 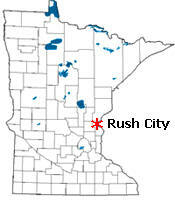 It had a station on the St. Paul and Duluth Railroad, lumber and flour mills, elevators, and a post office established in 1870; it was briefly called Rush in 1895. The city received this record by Folsom: "In 1868, at the completion of the St. Paul and Duluth railroad, a depot was built and a station established at the crossing of Rush river, around which rapidly grew up the village of Rush City. It was surveyed and platted by Benjamin W. Brunson, surveyor, in January, 1870. The Rush City area was first inhabited by Dakota and Chippewa Natives who were attracted to its bountiful hunting and fishing opportunities. Later, pioneers made the area their home because of logging, fur trapping, and farming opportunities it had to offer. The village that was soon established quickly grew in population and Rush City was incorporated on March 8th, 1873. The name "Rush" City was chosen for the abundance of bulrushes (cattails & other similar aquatic plants) that occupy the area. Rush City quickly became a commercial hub, bustling with activity. A railroad used to bring folks across the St. Croix River from Grantsburg, Wisconsin to the booming downtown for their weekly shopping needs. On the trip home, passengers would stop at the famous blueberry patches near the river to picnic, which is how the railroad earned its nickname "The Blueberry Special." 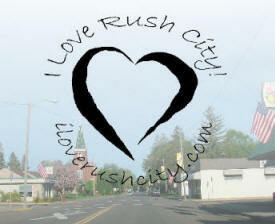 Many things have changed since the good ole days, but Rush City continues to prosper and grow in population. The city's Industrial Park is one of the largest industrial parks between the Twin Cities and Duluth, employing over seven hundred workers. The economy is also based on agri-business, health-care, education, manufacturing, retail, corrections, and tourism. Rush City is a town full of memories with an eye to the future. Take a look around our website to find information on tourism, how to start a business, the industrial park, the airport, local events & more. Welcome to Rush City! Stay awhile. Up North Starts Here. 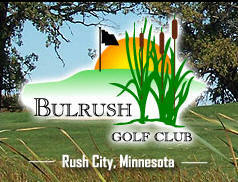 Bulrush Golf Club is located in Rush City, MN just 45 minutes north of the Twin Cities. The course measures from 6,929 from the championship tees to 5,234 yards from the forward tees. The course design will captivate golfers of all skill levels. 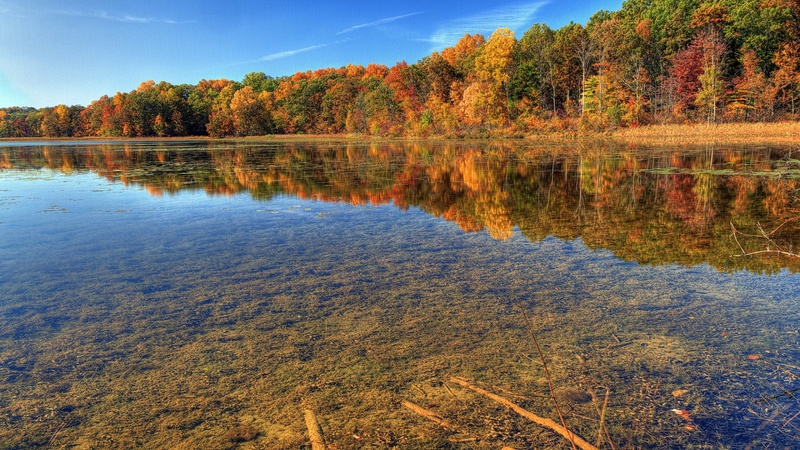 It's beautiful terrain, wooded areas and wetlands are the best kept secret in Minnesota! Fairview Rush City Clinic is committed to the health of our patients and our community. We offer high-quality medical care and services for people of all ages -- from newborns to seniors. We specialize in personal, coordinated care and take pride in caring for the physical, mental and emotional health of our patients. Flickabirds Resort is the perfect place to enjoy the outdoors with your family or friends. 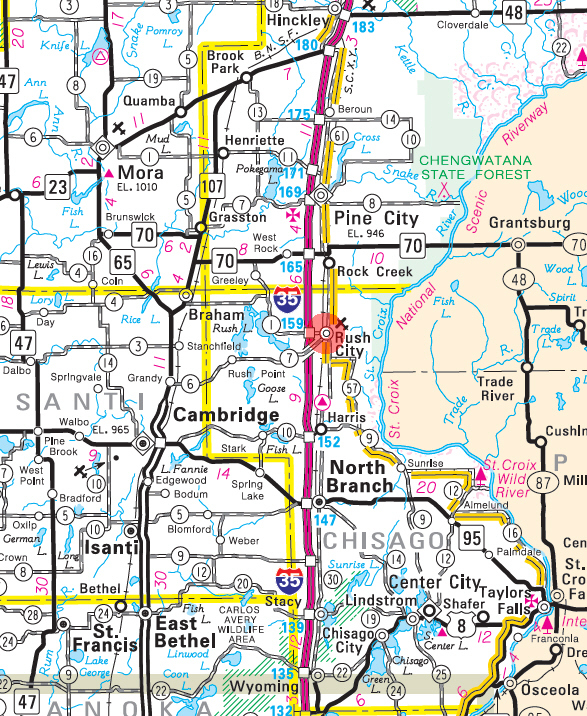 We are located just 6 miles west of Rush City, Minnesota and offer 50 seasonal campsites perfect for your summer enjoyment. 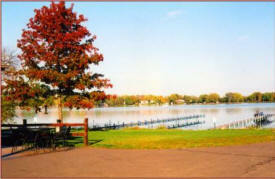 Our resort features some of the best fishing, boating, snowmobiling and recreation in the area! We are here to supply all your formal wear needs. We offer tuxedo rentals as low as $75 and will meet or beat any price on wedding gowns, bridesmaids dresses, and more! 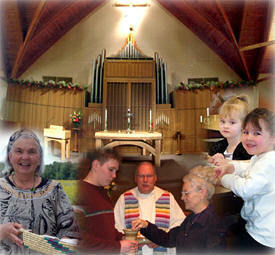 ECS has been providing prompt and dependable service to the residents of East Central Minnesota since 1969. Customers can expect reasonable rates and great service from East Central Sanitation & Recycling. With a wide variety of containers and pick up areas we can provide service for almost every type of disposal and recycling need. 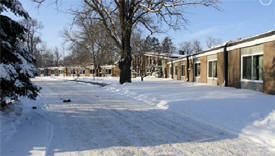 Fairview Pharmacy - Rush City is located next to the Fairview Lakes Clinic - Rush City. From Hwy 35 take the Rush City exit (Cty. Rd. 361) and drive east. 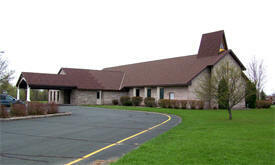 The pharmacy and clinic are located on the south side of the road just past Cty. Rd. 54. 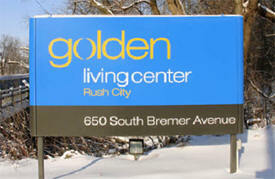 G & G Auto Supply, Inc.
Golden LivingCenter – Rush City is a skilled nursing facility located in Rush City, Minn. At Rush City, we are dedicated to providing individualized care in a clean, comfortable environment. We understand how important it is to return home quickly after an illness or surgery, so we offer short-term rehabilitation to help make this possible. In addition, our LivingCenter has an Alzheimer’s care unit and offers a variety of health care services, including stroke rehabilitation, wound care and IV therapy. 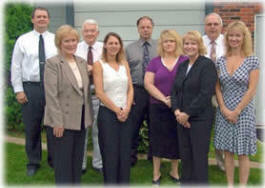 At Hermann Insurance Service, Inc, we do not work for an insurance company; we work for you. We work on your side when you have a loss and follow through to see that you get fair, prompt payment. 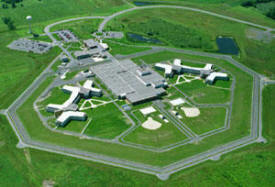 The Minnesota Correctional Facility-Rush City opened in February 2000. The close-custody, level-four facility currently houses 982 offenders (7/08), most in double-bunked cells. Offender activities are conducted on a strict schedule. Family-owned since 1956, Rush City Hardware is your #1 source for hardware. From pipe cutting and key cutting to hunting and fishing equipment sales and rentals, we can handle it all; there is no job too big or too small!